The hand work has been temporarily abandoned. Why? So that I can work on a sweet little quilt for a soon to be born baby boy. The Mommy is decorating the nursery in sail boats with the main colors being red white and blue. When I was told this, I went looking for fabric I found a fun line at Connecting Threads. It is called "Smooth Sailing" I ordered the Mariner's Star design in Silver Lining. I got some red, blue and gray at the local quilt shop. I also ordered the 10" square sampler. I will use some of it in the pieced backing. Of course as I started working on it, I changed a few things. So here is the finished top. It is raining here today so I had to do an indoor picture. It isn't the greatest picture, but you get the idea. I love the way this came out. I just have to say Thank you! to Connecting Threads and to Electric Quilt for such wonderful products. 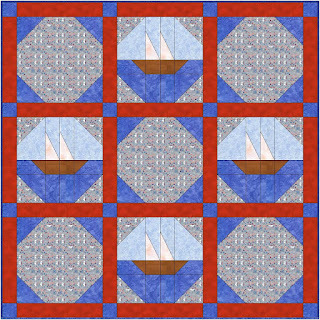 That is such a cute little boy quilt! Nice job! Gene, that is just absolutely adorable! I love your design, and I love those fabrics from Connecting Threads. You are going to make one little boy - and his mommy - very happy, indeed! Very cute! What a lucky baby! What a sweet little quilt... some one is really going to love it! Looks great Gene! What a great gift! Your quilt is sooooo adorable....I love love love love..did I say...love it!!! Love seeing how your blocks developed...the final top is really cute! I'm enjoying seeing your art piece progress, too! Love it!! I'm sure the Mama & baby will too!! Gene, I'm back to reading my blogs!!! Love the quilt, and how you amended your own design. It is great. The little boy will love it, as will his Mommy. Oh I bet they just fall in love with it! I love your design too. What a perfect quilt for a boy. I do like CT's fabric.